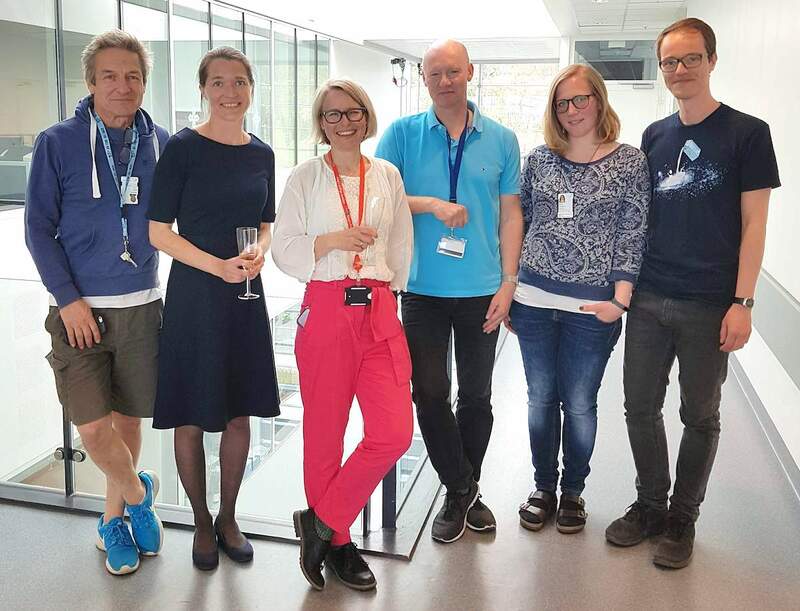 An article by senior scientist Lene Malerød and her co-workers in Kaisa Haglund’s project group shows how the mitotic spindle achieves its correct orientation during cell division. The article ”Centrosomal ALIX regulates mitotic spindle orientation by modulating astral microtubule dynamics” was published online on June 1 in The EMBO Journal and elucidates a previously unrecognized biological role of the multifunctional adaptor protein ALIX during cell division. 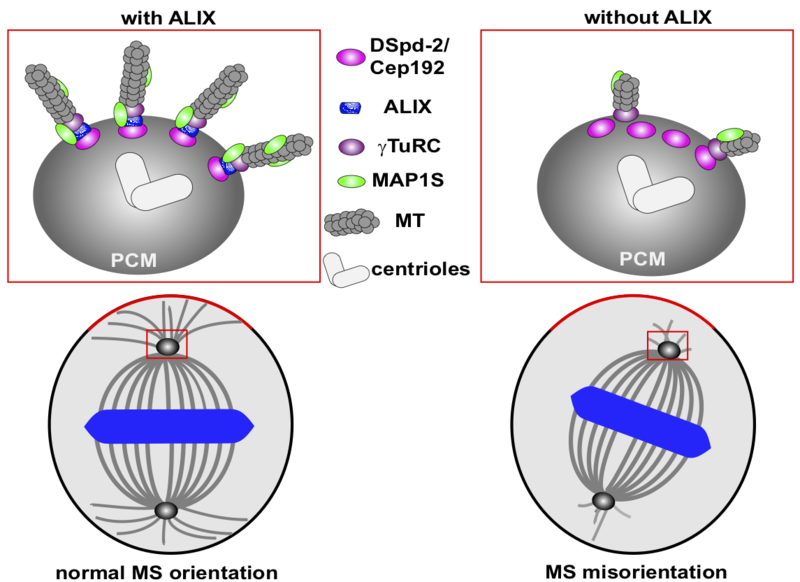 Specifically, ALIX is recruited to centrosomes, where it promotes correct mitotic spindle orientation at metaphase during both asymmetric and symmetric cell division, by facilitating the formation of astral microtubules. The work has been performed in collaboration between members of Kaisa Haglund’s project group in the lab of Harald Stenmark at the Department of Molecular Cell Biology, Institute for Cancer Research (Oslo University Hospital) and Centre for Cancer Cell Reprogramming (Faculty of Medicine, University of Oslo), Roland Le Borgne (CNRS, Institut de Génétique et Développement de Rennes, University of Rennes, France), Knut Liestøl (Department of Informatics, University of Oslo) and the Advanced Light and Electron Microscopy Core Facilities at the Institute for Cancer Research (Oslo University Hospital). Astral microtubules serve to anchor the mitotic spindle to the cell cortex in the correct orientation, which is especially essential during asymmetric division of stem cells to generate cells of different fates and during planar division of epithelial cells to give rise to a monolayered epithelium. Understanding the mechanisms controlling mitotic spindle orientation is relevant to cancer, because aberrantspindle orientation in stem cells might contribute to defects in asymmetric cell division, which in turn can lead to tumour formation. At the molecular level, ALIX is recruited to the pericentriolar material of centrosomes by the scaffold protein DSpd-2/Cep192 inDrosophila melanogasterand human cells. Here, ALIX promotes nucleation and stabilization of newly formed microtubules by recruiting γ-tubulin and MAP1S to the centrosomes, respectively. Consequently, lack of ALIX causes mitotic spindle misorientation in human cultured epithelial cells in vitroand in fly stem and epithelial cells in vivo. In summary, the study reveals an evolutionarily conserved role of ALIX in regulating the orientation of the mitotic spindle by promoting astral microtubule formation during asymmetric and symmetric cell division. Schematic model of the role of ALIXin promoting correct mitotic spindleorientation. See the text, and article, for details. Centrosomal ALIX regulates mitotic spindle orientation by modulating astral microtubule dynamics. Malerød L, Le Borgne R, Lie-Jensen A, Eikenes ÅH, Brech A, Liestøl K, Stenmark H, Haglund K.
EMBO J. 2018 Jun 1. pii: e97741. doi: 10.15252/embj.201797741.